Sue Tacke and Amiri Osman’s day-to-day lives are quite different — Sue is an artist and dryland farmer who lives in North Central Idaho’s Camas Prairie and Amiri is a refugee from the Democratic Republic of the Congo adjusting to life in Boise. But, the two of them share a love of the batik art form. Osman and Tacke dip their brushes in a pot of wax propped up on a five-gallon bucket. After this, dye is applied to seep through these crackles: forming lines in the background that are unique to batik. Tacke and Osman met monthly at The Gem Center for the Arts to produce batiks as part of an apprenticeship program offered by the Idaho Commission on the Arts’ Folk and Traditional Arts Program. At an art studio in Boise, Sue Tacke is applying wax over a wobbly, day-old calf that she’s drawn and dyed onto this piece of fabric. A pot of wax sits between her and Amiri Osman — it’s propped up next to the newspaper-covered table they are sharing. Osman introduced her to this kind of wax. Prior to this, Tacke was using a combination of beeswax and paraffin to produce batiks of mostly nature scenes. Osman explains that silhouettes work well in this medium: Batik is made by applying wax onto fabric in layers, using it to resist color from dyes. What doesn’t tend to work well? Scenes with a lot of color and detail. “He keeps telling me to go simpler with my drawing because this is not paint — it’s wax,” Tacke says. The calf piece was a step in that direction, but she is worried it will end up looking like a cartoon. She’s in an apprenticeship with Osman offered by the Idaho Commission on the Arts’ Folk and Traditional Arts Program. 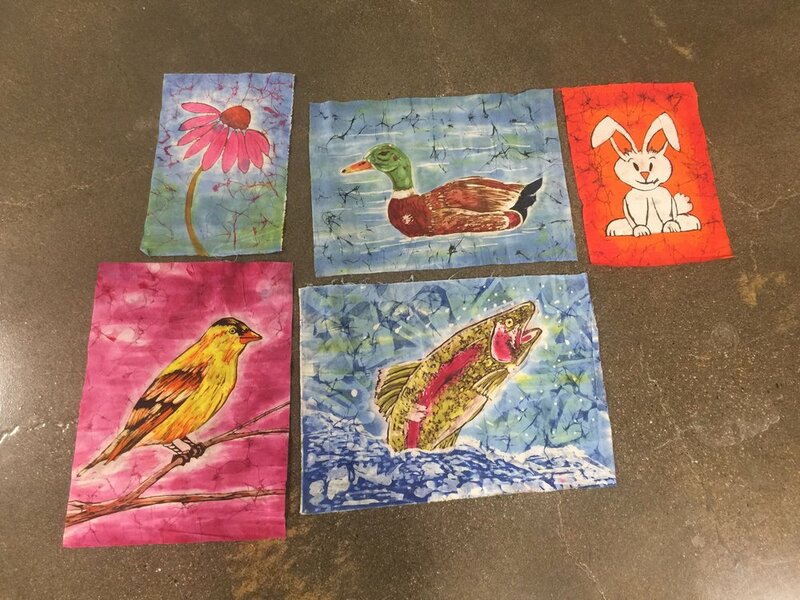 And their time together has been prolific: Tacke has produced about a dozen batiks. Osman has been doing batik for 35 years. He initially learned from his uncle in the Congo and later took art classes in Tanzania. Sometimes, he’ll start a sketch and work on it for weeks before he pencils it on fabric. Other times, he free hands. These are among the dozen batiks Tacke has produced while apprenticing with Osman. Others include a baby calf, a butterfly and tree. As seen in this batik, Osman regularly works with analogous color schemes. The new tree coming up is sprouting out of a broken tree. There’s deeper meaning behind this, Osman says, about renewal. The first piece Tacke saw by him was a woman with children on a bicycle. Had she created the piece, Tacke says she would have been tempted to include more facial features and the spokes on the bicycle, but she’s realizing that in batik, that’s not always needed. Osman has some advice for how Tacke can evolve as a batik artist. “There’s no need to have a lot of colors,” he says. In other words: With fewer colors, your image will translate. Osman taught Tacke this technique of scrunching up the fabric to shake off the majority of the wax before using an iron to remove the rest. Tacke cracks the layer of wax she applied earlier. She says in the beginning of the apprenticeship she was timid with the cracks, but now with Osman’s help she’s developed a rhythm. At this stage in batik, the cracks in the wax re-expose the fabric, allowing color to seep in and make elaborate patterns. “If I hold it up to the window, you can see how the dye has come through the cracks and into the background,” she explains, going on to say that these crackles are what’s unique to batik. In these quieter, reflective moments, Tacke has tried to put herself in Osman’s shoes. “What if I was a refugee in the Congo, and I didn’t speak Swahili or French and I’m trying to make a living in this whole new country and my heart is being drawn to doing art, but I have to work in food service in a hotel to pay the bills?” she wonders. That was Osman’s first job when he moved to Boise a couple of years ago. Now, he’s employed at a company that produces linens and uniforms. At this point in the batik process, it is time to iron off the rest of the wax. But before that, Tacke scrunches the fabric and shakes off the majority of the wax. In this final stage, sheets of newspaper soak up the wax as it is melted with an iron. Tacke may be her own worst critic. But, she’s taken what she’s learned from her mentor to heart: Her next two pieces are silhouettes with fewer colors. She’ll make these at her farmhouse near Cottonwood, Idaho but when she visits Boise, she plans to melt wax again with Amiri. 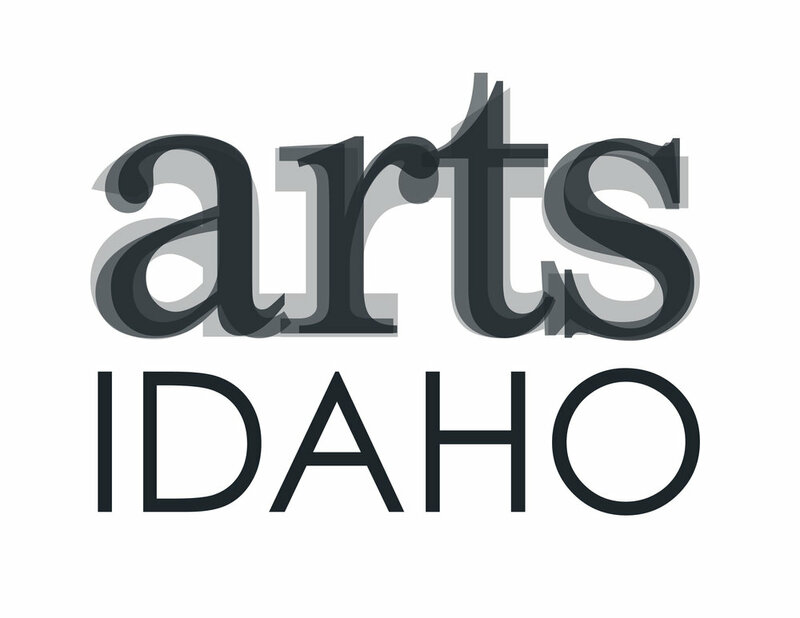 This piece was produced for the series Expressive Idaho in partnership with the Idaho Commission on the Arts’ Folk and Traditional Arts Program and with funding support from the National Endowment for the Arts.